Estimated 10,000-15,000 head when fully developed, in particular when the northern boundary is fenced. 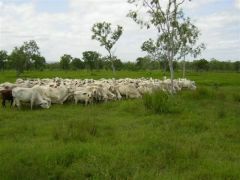 The Strathburn "calf factory" was bought "bare" in 2007, with ownership and care of the mixed-Brahman herd remaining with its longstanding owners. 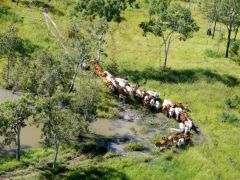 In 2008, the 6000-strong herd was sold to a new owner keen to expand the breeding of strong young weaners at Strathburn. 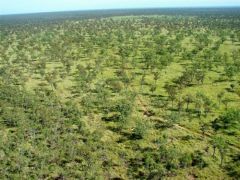 On the low rises and sandy plains of the South West area of the property, within the headwaters of the Edward River, the dominant vegetation consists of open woodlands comprised of Messmate interspersed with Bloodwoods, scattered ghost gums and some box on the more defined creek beds. 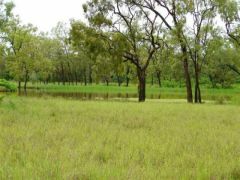 This type of country extends to the Holroyd River and across to the North East corner of the property. This area dominates 33% of the property but in this case soils are interspersed with river front alluviums and semi alluviums. Ground vegetation is sparse to mid density dominated by giant spear grass, fire grass and some sedge families. Situated within the catchment area of the Holroyd and Edward River systems and bounded to the east by Melonhole Creek lies an area of approximately 10,000 ha of deep uniform cracking grey loams and shallow melon holes plains carrying approximately 16,744 HA (6.34%) of shiny (silver) leafed box interspersed with coolibah. This box area provides a large range of different annuals and perennials form the ground cover following monsoon rains. The open vegetation on the alluvial plains provides valuable grazing for the property as it is subject to annual flooding. To the North East of the property soils consist of deep yellow sands on plateau interspersed with grey and yellow sandy loams of which the dominant tree species are messmate interspersed with Bloodwood of varying degrees and Molly/Red Box on river frontage and undulating plains. Patches of Ironbark can be found in the North East area from the homestead interspersed with box. The soils in this area have a higher carrying capacity than the Western area of the property as this area carries a good body of feed. To the South East of the property within the catchment area of the Edward River soils consist of yellow to brown moderately deep to varying shallow soils carrying medium to dense areas of bloodwood and messmate. 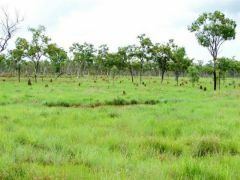 Scattered within the Eastern half of the property the rivers are lined with Rainforest or Paper Bark whilst wet areas or shallow drainage areas are often vegetated with quinine and Tea Tree etc (25,709 HA).